Saw this on BoingBoing last week. 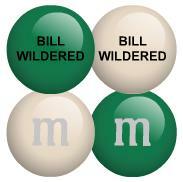 You can customize your own M&M's. You can choose 2 of 21 available colors and have a different two-lined message on one side of each with classic 'm' on the other side. Apparently there are multiple restrictions on what you can say (the BB post gets into more detail on this). Sorry I didn't post this sooner though, it looks like they've had so many orders that they can't guarantee delivery in time for Christmas anymore. I believe they're saying Dec 28th right now. If you're interested, check out the site - shop.mms.com. When did "competition" become a bad word? How to talk to a real human? Still not sure what a Blog is? What's the deal with lists?